Info Speed up, and throw right at the line! Match angle and draw long for Super Throw! Run up as close as you can to the foul line without crossing it, and throw your javelin farthest to win. Javelin Throw is an Event that appears in the Nintendo 3DS version of Mario & Sonic at the Rio 2016 Olympic Games. The objective of this event is to throw the javelin as far as possible, with the starting world record for the event being 98.48m and the starting Olympic record being 90.57m. The playable characters for this event are Mario, Wario, Dry Bowser, Sonic, Knuckles, Omega and Mii, with Dry Bowser unlocked by beating him in Javelin Throw Plus on the fifth day of Sonic's story in the Road to Rio mode. Toads and Charmy appear as referees in this event. In the Road to Rio mode, Javelin Throw appears as the event on day 5 of Sonic's story. In this event, the player has three attempts to throw the javelin, the best of which will be recorded as their final score. Before the player starts running, they will be told the current windspeed and direction, and the angle that they should aim to throw at. If there is no wind, the player should aim for an angle of 45°, or an angle up to 6° outwards from that for a light wind between 1m/s and 3m/s. For a windspeed between 4m/s and 6m/s, the player should aim for an angle between 7° and 12° out from 45°. If the windspeed is between 7m/s and 9m/s, it will be classed as a gale and require an angle over 13° outwards. Whether the extra degrees are added or subtracted from the initial 45° angle depends on whether the wind is in front or behind the player, with them being added for a tailwind and subtracted for a headwind. This information is also given as the player prepares to throw the javelin. To start running, the player must slide quickly left and right on the Touch Screen, which will cause their character to accelerate. The character's speed is indicated by a meter at the bottom of the screen, which will increase until the player stops sliding and lifts the stylus off the Touch Screen. The character will decelerate however if the player's sliding speed drops. 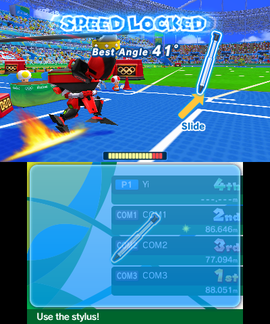 After they have lifted the stylus, the player must draw a long line on the Touch Screen before throwing the javelin in the desired angle to throw it. An angle within 3° degrees of the suggested one will give them a Perfect rating, within 10° awards Great and within 15° gives Good. However, if the player throws the javelin after crossing the line, fails to throw it at all, slides with too high or too low an angle or slides too short a line, they will receive a foul and no distance will be recorded for that attempt. The running speed, angle at which the javelin is thrown, length of the player's slide and distance before the foul line from which the javelin is thrown all affect the distance which the javelin can be thrown. Particularly good throws will cause the arrow to gain various effects, with the best throws gaining the Super Throw effect, which has a red glow and flames. When you throw the javelin, both the angle and length of the line you draw are important. Try to draw a long, straight line. Fouls happen more often when you slide more during the run up, but you can also throw the javelin farther. Stop sliding during the run up to lock your speed. Move the stylus away quickly once you've filled the gauge. This page was last edited on March 7, 2019, at 20:57.